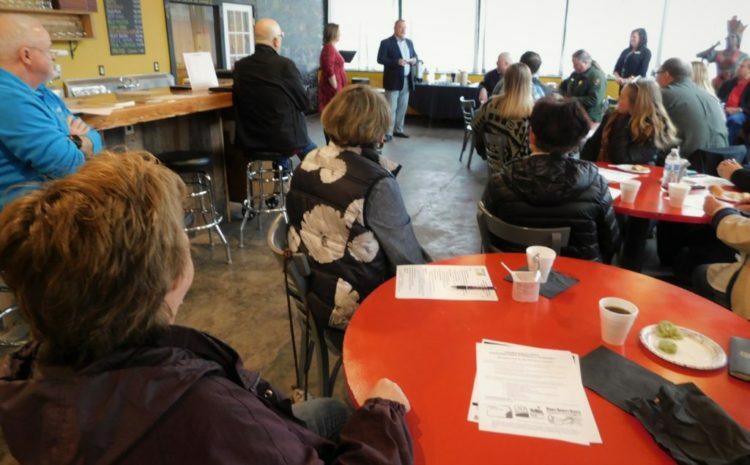 Bryan Ritter, brewmaster for the Boiler Room Brewhaus, speaks to the Quarterly Downtown Meet and Greet attendees on Tuesday morning. Bryan and Barbara Ritter, owners of the business, hosted the event. 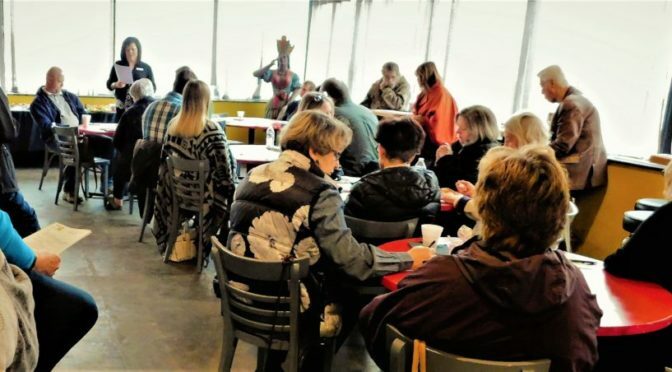 The Quarterly Downtown Meet and Greet meets several times a year to allow people interested in downtown Fort Scott to share ideas/events. Bryan Ritter, who along with wife, Barbara, own the Boiler Room Brewhaus, hosted the Meet and Greet on Tuesday on Feb. 5. The business sold 2,000 gallons of beer last year, he said. Besides making and selling beer, they host events. Their contact information: 913-636-4892 or 620-644-5032 or beer@boilerroombrewhaus.com. Fort Scott Chamber of Commerce Executive Director Lindsay Madison said Project 17 has a user-friendly Wix platform available to businesses who have under $1 million in revenue. Madison also said the Chamber is finalizing its Business Locator Map Pinpoints and Ads, with a focus on shop, dine, play and stay businesses. She said there is ad space on the Skubitz Plaza Downtown Directory Sign, for $100 a year. Madison said the KOMB 103.9 Home, Sport, Farm and Garden Show is April 5-6. Ally Turvey, from the Fort Scott Convention and Visitors Bureau, said the bureau is continuing to sponsor the downtown family movie nights. This year the entertainment evenings will move to Skubitz Plaza and one of the four films featured is about Sgt. Stubby: An American Hero. The City State Bank Ribbon Cutting begins at 5 p.m. Thursday, Feb. 7. Hedgehog.INK will have a book signing featuring author Gerri Hilger. (Editors note: the book signing will be rescheduled from Feb.7, due to weather. )There will also be a story time Saturday featuring author Joyce Love, reading her rendition of “The Three Little Pigs.” In addition, local artist Jean Solomonson will lead the children in card making. Madison informed the attendees of the Google live stream”Give Your Website a Refresh” on Wednesday, March 6 from 11 a.m to noon at the Lowell Milken Center. Attendees will learn about search engine optimization and best practices for creating a search-friendly site. Also, there will be a Bill Drury Seminar, May 7 from 8 a.m. to noon, with a focus on “Effective Leadership For First Line Managers and Supervisors,” Madison said. There are grants available for downtown businesses to refresh a facade, see Rachel Pruitt with the City of Fort Scott for more information. Carl Brenner, Fort Scott National Historic Site, said there are student position openings at the fort this summer. Martha Scott, Friends of the Fort, said subscriptions are continuing for installing flags at residences/businesses in celebration of national holidays. The group charges $35 a year and will install and take down the flags. Business owner, Jared Leek, said Valentines Day has been sold out at Crooner’s Lounge, but days before and after are available for reservations. He said on Feb. 16 Elton Dan, an Elton John impersonator will perform at the Liberty Theater. Leek also said that the Bourbon County Arts Council has six events coming this year downtown, the first one is March 9. Pat Lyons, Lyons Twin Mansions, said they and the Courtland Hotel are part of a “Most Romantic Weekend In Kansas” promotion on Valentine weekend. Fort Scott City Manager Dave Martin gave updates on healthcare, the Craw-Kan Cooperative broadband project, Mark McCoy’s group to unify the city/county governments, and parking issues downtown. Fort Scott Economic Development Director Rachel Pruitt said Fort Scott Lofts, formerly Western Senior Living, now only require 20 percent of residents to be 55 years old and older. Pruitt also said the Warrior Convoy parade through town, in connection with Adam LaRoche’s Wounded Warrior Hunt, will be May 1 this year. Fort Scott Codes Director Rhonda Dunn said a possible U.S. Cellular cell phone tower downtown is in the design phase and stated it is a process that the public will be allowed input on. Lee’s Paws and Claws Animal Shelter is having an online Facebook auction that includes several large appliances: computer, refrigerator, freezer. The auction closes today, Feb. 7 at 8 p.m.